The year is 1942: eight American airmen crash-land during the Doolittle bombing raid on Tokyo and are taken prisoner. 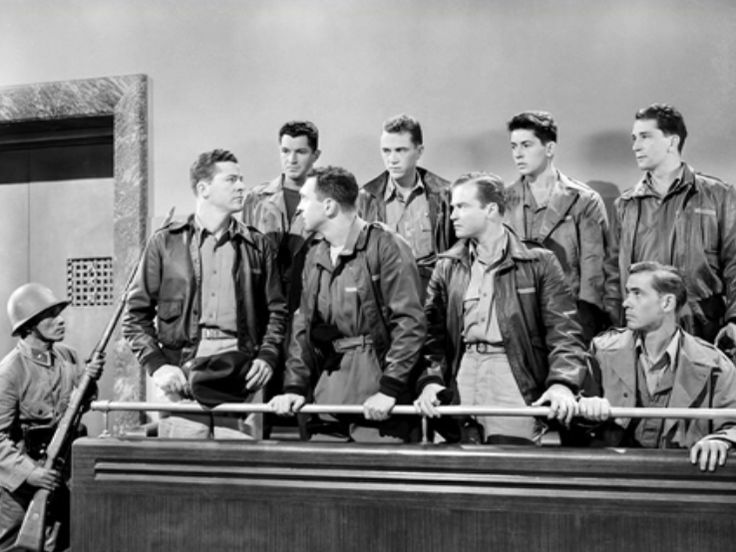 Though slated for execution, the pilots are put through a “show trial” by the military, on a charge of committing war crimes. The Japanese judges promise to be merciful if only the Americans will reveal vital US military secrets. But Captain Ross speaks for the rest of his melting-pot crew – some of whom have been subjected to the most horrific of tortures – when he chooses death before dishonor. But the Japanese still have a few cards to play. Will any of the men talk? As for the rest of the eight, while I might not always be able to match names with faces, they all stick out as individuals in my mind. 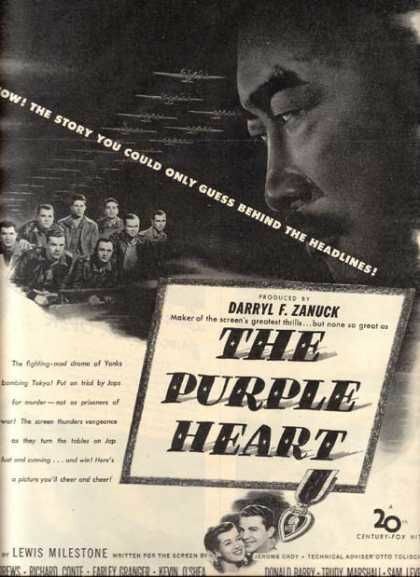 Since The Purple Heart is a relatively short movie (an hour and forty minutes long), and has quite a bit of storyline to wade through, it would’ve been understandable if only a three or four of the cast members had gotten good characterization, but each character is deftly defined through sharp dialogue, flashbacks, and the excellent acting of the cast members themselves. Stoner reciting poetry, Ross’ flashback (‘Red River Valley’ again? Are you KIDDING ME??? ), Canelli and his family’s dream of another Michelangelo, etc.,etc. It’s easy to see that these men care about each other, what with Ross’ birthday celebration and how ecstatic they all are to find each other again after the plane crashes (Clinton and Greenbaum’s hug is one of the best things ever). The close friendship the eight of them share is amazing, and when they all stand up and cheer after Greenbaum’s speech, I feel like cheering too. One of my favorite scenes is when they’re all deciding whether or not they should give in and tell the court everything they want to know. Vincent’s memory coming back just a little when they all sing ‘The Battle Hymn of the Republic’ (and the crowd outside hears it), Ross realizing just how they’re going to go about voting, and then each man dropping in his wings. Broken or unbroken? 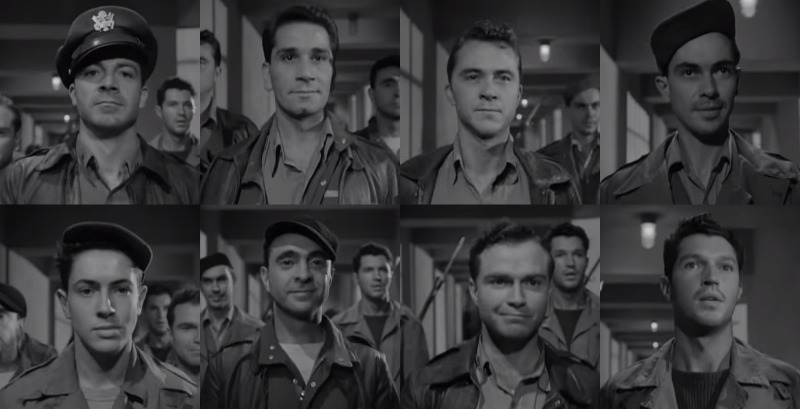 The Purple Heart did a number on my nerves the first time I watched it, especially when the whole torture-cycle started, because I already immensely liked all the characters. Seeing them dragged off, not knowing if any of them would die (I was almost positive none of them would talk, but they could die)…it was almost like I was experiencing the same worry and tension that the actual characters were, which I suppose is what the filmmakers wanted. 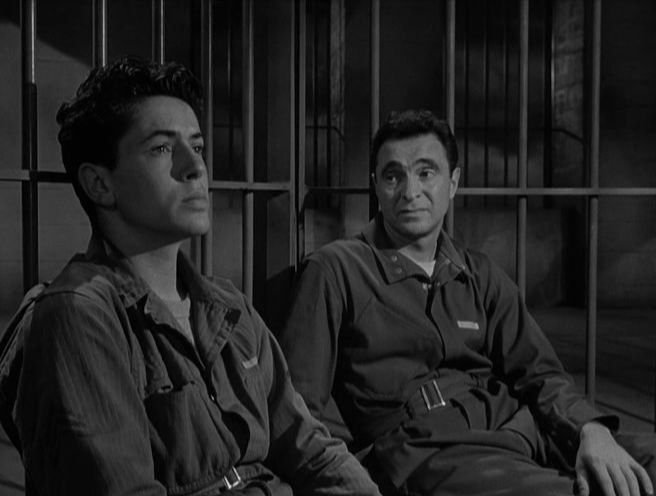 The pressure keeps building and building, so like I mentioned earlier, this is a pretty exhausting film to watch (if you care about the characters, that is), and when Ross makes his final speech, it’s like all the pent-up anger and defiance is pouring out of him and it’s wonderful. And then they march off and, yes, it’s sad – heartbreaking, even. But it’s also heroic and brave and inspiring; basically the film in a nutshell right there. Then here’s to our boyhood, its gold and its gray! The stars of its winter, the dews of its May! The horrible thing about it is, people really DID get tortured like that, for real, in WW2. It’s hard to imagine (for me, anyway) but it’s true. Same here. Just reading Unbroken gave me the shivers. Sigh. Such a wonderful film. It would be a good one to dig out today, since it’s Independence Day here in the US and all! Glad to see you back blogging again 🙂 Things must be settling down a bit, huh? Great idea! My siblings and I are going to watch the first Captain America movie; I haven’t seen it for a while, so that should be fun. That post (and the one coming later tonight or tomorrow) was actually scheduled, but things are getting back to normal. 🙂 We finally got the dining room table put back together this evening, so supper was the first meal eaten in The New House where we didn’t have to all sit on couches and random chairs. Yay!